i did mention there was a car show at whittier high school a couple of weekends ago, as a fundraiser for the baseball team. i didn't get there as earlier as i'd planned, so the sun was already pretty harshly in the sky. there were a decent number of cars there, mostly chevys. main club representing was the bomb squad. not sure if this one is one of theirs, as the majority of those were around the corner from this one. it was such a brilliant green, enhanced by the sun, i had to have it. wish the owner would have closed the trunk. eh, the owner was behind the next car over, and seemed oblivious to hey, someone is taking a picture of my car. screw him, i cropped him out of the picture, so there. 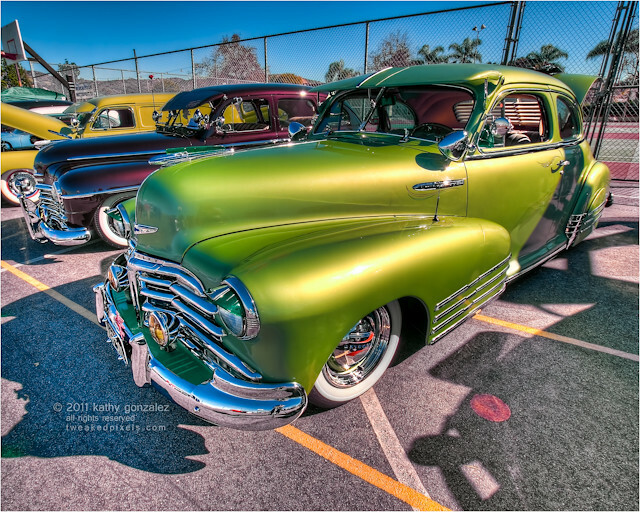 there were a number of cadillacs all hyped up on hydraulics, all jumped up and posing. i only took a couple of shots of those, cuz they aren't really my thing. they just make me wonder why they do that, but to each his own. there was a spectacular old chevy truck parked out on the street, i suppose because he didn't want to pay to participate for a trophy...there seemed to be plenty available, maybe everyone got one at the end of the day.